Signed lower left, Maud Knowlton. Oil on board. 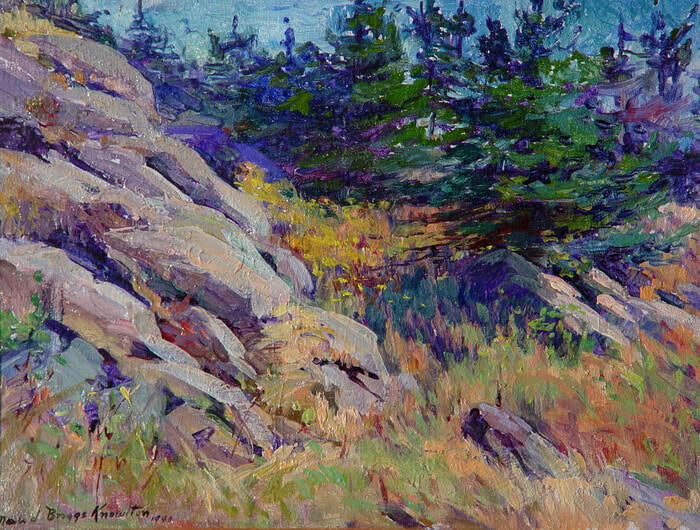 10" x 14"
​​Maud Knowlton was a dynamic ground-breaker. She and her friend Alice Swett were the first two women artists in the famous Monhegan Island (Maine) artist's colony. They painted at the turn of the 20th century on this island twelve miles off the coast of Maine, no easy journey, along with a dozen or so other hardy artist souls like William Trost Richards, Alfred Bricher and Eric Hudson. Known for her excellent instincts and strong work ethic, Knowlton is known to have famously said, "One good canvas is worth a whole gallery of undistinguished paintings." She exhibited at the New York Watercolor Club, the Boston Art Club, the Manchester Institute of Art, and the New Hampshire Society of Art. She was also President of the Manchester Inst. of Art for a time. She was a member of the American Association of Museums, the Society of New Hampshire Art, and the NH Assoc. of Arts and Crafts.